The concept of raga that was born more than a millennium ago cannot be summed up in a pithy definition. It involved a rather vast concept within which the relation between a given raga and a particular mood, a season or a time of the day is as important as its melodic structure. The word raga derives its root in the Sanskrit term ranj, which means "that which affects or colours the mind and brings enjoyment". Much more precise and far richer than a mere mode, the raga can be considered a melodic framework suitable for composition and improvisation, a dynamic musical entity that enjoys a unique form, embodying a singular musical idea. 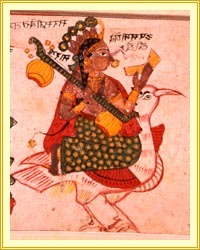 Made up of a fixed scale, each raga has a certain number of identifiable characteristics such as the order of appearance and the hierarchical ranking between its intervals; the magnitude and duration of each note and even the exact technique sometimes needed for its appearance. When raga contain identical scales, these characteristics let us differentiate between them. The human voice has always been considered king in India. The bin, as well as the fiddle sarangi or even the flute bansuri, are quite indeed the only instruments having expressive capacities close to the human voice and it is on this account that the bin was once associated with dhrupad singing. This musical genre - which surfaced in the 15th century A.D. in the court of Raja Man Singh Tomar of Gwalior – consisted of poetry written in medieval Hindi. Dhrupad saw its apogee in the 16th and 17th centuries during the reign of the first Mughal emperors and it wonderfully demonstrates the unfolding of a raga through its two main movements: the alap and the bandish, or composition. The alap itself consists of three parts: the actual alap, an unmeasured prelude during which the musician will slowly and very systematically develop the melodic edifice in which the raga will materialise; the jod, whose unfolding will adopt a pace similar to that of the alap but marked by the appearance of a binary beat; and finally the jhala, where the tempo picks up and which will be supported by overlapping melodic phrases with a set of rhythmic units that are often syncopated. Then comes the composition during which the musician plays a fixed melody, followed by improvised variations, all set within a given rhythmic cycle. A horizontal two-sided drum, the pakhavaj, which also freely improvises on the theme, accompanies him. The timbre of the bin, its deep resonance and the range of its glissandi give it the rare ability to convey remarkably well the different components of a raga in dhrupad. But while a raga and its performance follow a certain number of strict rules, the binkar have – through the centuries – evolved playing styles distinct from one another. The musical selections recommended here reflect the rich legacy of this instrumental tradition as well as of the different playing styles still prevalent even during these last fifty years.